A model of a German SAR-Lupe reconnaissance satellite inside a Cosmos-3M rocket. A reconnaissance satellite or intelligence satellite (commonly, although unofficially, referred to as a spy satellite) is an Earth observation satellite or communications satellite deployed for military or intelligence applications. The first generation type (i.e., Corona  and Zenit) took photographs, then ejected canisters of photographic film which would descend to earth. Corona capsules were retrieved in mid-air as they floated down on parachutes. Later, spacecraft had digital imaging systems and downloaded the images via encrypted radio links. In the United States, most information available is on programs that existed up to 1972, as this information has been declassified due to its age. Some information about programs prior to that time is still classified, and a small amount of information is available on subsequent missions. A few up-to-date reconnaissance satellite images have been declassified on occasion, or leaked, as in the case of KH-11 photographs which were sent to Jane's Defence Weekly in 1984. On 16 March 1955, the United States Air Force officially ordered the development of an advanced reconnaissance satellite to provide continuous surveillance of "preselected areas of the Earth" in order "to determine the status of a potential enemy’s war-making capability". There are several major types of reconnaissance satellite. Provides warning of an attack by detecting ballistic missile launches. Earliest known are Missile Defense Alarm System. Identifies and characterizes nuclear explosions in space. Vela (satellite) is the earliest known. Provides imaging of earth from space. Images can be a survey or close-look telephoto. Corona (satellite) is the earliest known. Spectral imaging is commonplace. Signals intelligence, intercepts stray radio waves. Samos-F is the earliest known. 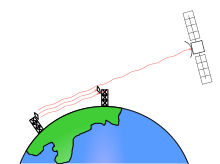 Most space-based radars use synthetic aperture radar. Can be used at night or through cloud cover. Earliest known are the Soviet US-A series. On 28 August 2013, it was thought that "a $1-billion high-powered spy satellite capable of snapping pictures detailed enough to distinguish the make and model of an automobile hundreds of miles below" was launched from California's Vandenberg Air Force Base using a Delta IV Heavy launcher, America's highest-payload space launch vehicle. 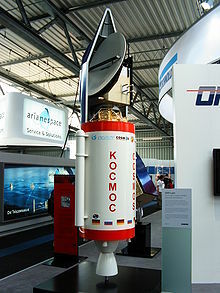 On 17 February 2014, a Russian Kosmos-1220 originally launched in 1980 and used for naval missile targeting until 1982, made an uncontrolled atmospheric entry. 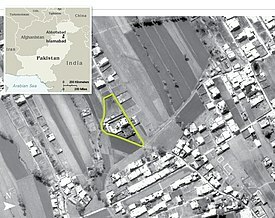 Reconnaissance satellites have been used to enforce human rights, through the Satellite Sentinel Project, which monitors atrocities in Sudan and South Sudan. ...photo-reconnaissance satellites, for example, are enormously important in stabilizing world affairs and thereby make a significant contribution to the security of all nations. Additionally, companies such as GeoEye and DigitalGlobe have provided commercial satellite imagery in support of natural disaster response and humanitarian missions. ^ "Corona History". National Reconnaissance Office]. Retrieved 15 February 2014. ^ "Corona Program". [Mission and Spacecraft Library]. Retrieved 16 February 2014. ^ Wright, Michael; Herron, Caroline Rand (8 December 1985). "Two Years for Morison". The New York Times. Retrieved 16 February 2014. ^ Erickson, Mark. Into the Unknown Together – The DOD, NASA, and Early Spaceflight (PDF). ISBN 1-58566-140-6. Archived from the original (PDF) on 20 September 2009. ^ Hennigan, W.J. (27 August 2013). "Monster rocket to blast off from Pacific coast, rattle Southland". Los Angeles Times. Retrieved 16 February 2014. ^ Melissa Goldin (17 February 2014). "Fragments of Soviet-Era Satellite Burn Up in Earth's Atmosphere". Mashable. Retrieved 17 February 2014. ^ "The State of the Union Annual Message to the Congress". 1980 State of the Union Address. The American Presidency Project. Retrieved 11 April 2014. ^ "Commercial Satellite Imagery Companies Partner with the U.S. Geological Survey in Support of the International Charter "Space and Major Disasters"". USGS Newsroon. United States Geological Survey. Retrieved 4 April 2014. ^ a b Heppenheimer, T. A. (1998). The Space Shuttle Decision. NASA. pp. 191, 198. Norris, Pat (2008). "Spies in the Sky: Surveillance Satellites in War and Peace". Berlin; New York: Springer; Chichester, UK: In association with Praxis Publishing. Retrieved 15 February 2012.